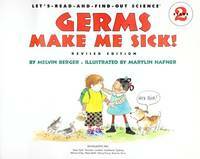 Home > Berger, Melvin > Germs Make Me Sick! 1985-08-05. New. Ships with Tracking Number! INTERNATIONAL WORLDWIDE Shipping available. Buy with confidence, excellent customer service! 1995-05-07. Good. Ships with Tracking Number! INTERNATIONAL WORLDWIDE Shipping available. May not contain Access Codes or Supplements. May be ex-library. Shipping & Handling by region. Buy with confidence, excellent customer service! Turtleback Books. SCHOOL & LIBRARY BINDING. 0808567322 New Condition. . New. Trophy Pr. PAPERBACK. 0064450538 New Condition. . New. Crowell. Hardcover. 0690044283 New Condition. . New. 1985-08-05. Good. Ships with Tracking Number! INTERNATIONAL WORLDWIDE Shipping available. May not contain Access Codes or Supplements. May be ex-library. Shipping & Handling by region. Buy with confidence, excellent customer service! Crowell. Hardcover. 0690044283 Like New Condition. . Fine. Trophy Pr. PAPERBACK. 0064450538 Like New Condition. . Fine. Turtleback Books. SCHOOL & LIBRARY BINDING. 0808567322 Like New Condition. . Fine. A Trunpet Club Special Edition. Used - Good. Shows some signs of wear, and may have some markings on the inside. A & C Black (Childrens books). Used - Good. Ships from the UK. Former Library book. Shows some signs of wear, and may have some markings on the inside. 100% Money Back Guarantee. Your purchase also supports literacy charities. Harpercollins Childrens Books. Hardcover. 0060242493 Nice book. Small tear on back of DJ. Light crease on top and bottom edge of front of DJ. No marks or tears in text. Name on first page. . Very Good. Crowell, 1985. Hardcover. Very Good. great looking book. HarperCollins, 2015. Paperback. New. 8 x 10 cm. US: Crowell. Hardcover. 0690044283 Good. No dust jacket. Spine little worn. First edition * books carefully packed and shipped promptly . Good. 1985. Harpercollins, 1985-04. Library Binding. Good. Trophy Pr, 1986-04-01. Paperback. Used:Good. HarperCollins. PAPERBACK. 0062381873 . New. HarperCollins. PAPERBACK. 0062381873 signs of little wear on the cover. . Very Good. HarperCollins. PAPERBACK. 0062381873 Minor shelf wear . Very Good. Turtleback. Used - Good. Former Library book. Shows some signs of wear, and may have some markings on the inside. Trophy Pr, 1986-04. Paperback. Good. HarperCollins. PAPERBACK. 0062381873 Special order direct from the distributor . New. Harpercollins. LIBRARY BINDING. 0690044291 Satisfaction Guaranteed. Please contact us with any inquiries. We ship daily. We only ship Internationally via FedEx with tracking which is why our shipping price might be higher than others. . Good. Harpercollins Childrens Books. Paperback. GOOD. Spine creases, wear to binding and pages from reading. May contain limited notes, underlining or highlighting that does affect the text. Possible ex library copy, thatâll have the markings and stickers associated from the library. Accessories such as CD, codes, toys, may not be included. HarperCollins. PAPERBACK. 0064451542 Ships promptly from Texas. . New. 1995. Harpercollins Childrens Books. Used - Very Good. Former Library book. Great condition for a used book! Minimal wear. HarperCollins. Used - Acceptable. Former Library book. Shows definite wear, and perhaps considerable marking on inside. Trophy Pr. Used - Good. Shows some signs of wear, and may have some markings on the inside.